If you think your laptop is fast now, just wait until you upgrade your computer’s current storage to a blazing-fast SanDisk internal SSD. The SanDisk SSD PLUS Internal SSD supports read speeds of up to 530 MB/s and write speeds of up to 440 MB/s. That’s megaBYTES, not megabits, so you we’re talking some serious speed here. 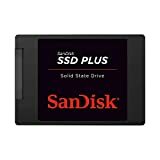 The 240GB model is on sale for $40 right now, and the 480GB SSD that retails for $200 is currently down to just $59.99. These deals probably won’t last long, so grab one at a deep discount while you can.